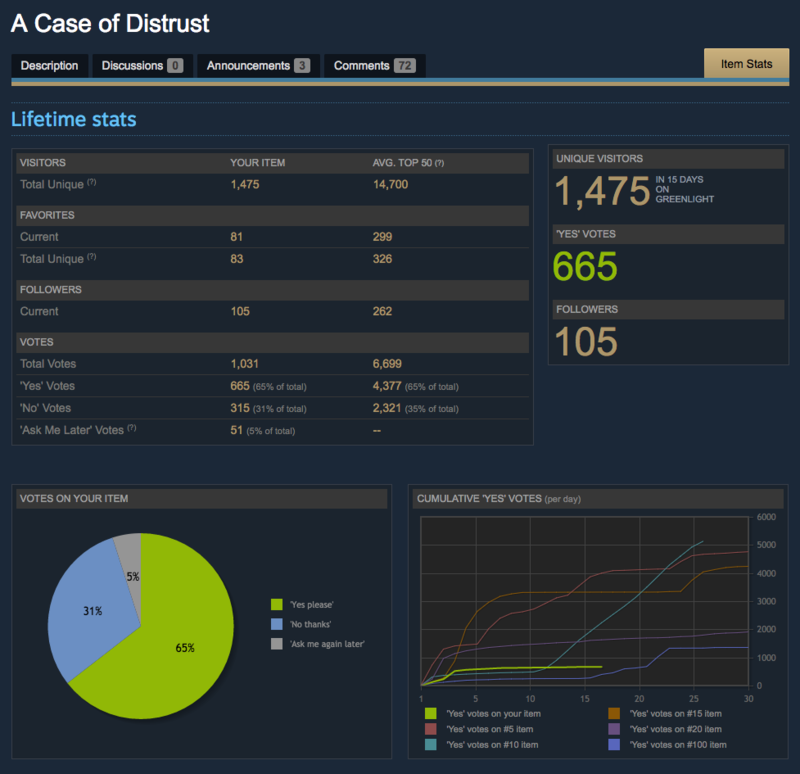 A CASE OF DISTRUST HAS BEEN GREENLIT! Thank you so very much to everyone who voted and who got others to vote! Your help has meant the world for this game. I’m thrilled that it will be on Steam! Now it’s time to buckle down and make sure it’s actually a success on Steam! I’ve got some new stuff cooking that I think will be fun to devlog about. And some new announcements for where and when you can play the game yourselves. Stay tuned! It took fifteen days total, and the game was bouncing between 30% and 32% of the Top 100 games. That number might not sound high, but I’ll reiterate what I’ve seen on other blogs: as long as you have “enough” votes, the total doesn’t seem to matter as much as percentage of Yes to No votes. I’ve heard anything above a 50/50 split is good with at least 500 votes, so A Case of Distrust‘s 65/31 worked in its favour. Again, Greenlight is a blackbox, so I’m only saying that my stats confirm previous suppositions on how Steam chooses games. But we could all be wrong–take it with a grain of salt! I’m guessing Kotaku’s article was the spike on the third day, and I’m sure the Adventure Gamers article helped a bit with the tail. 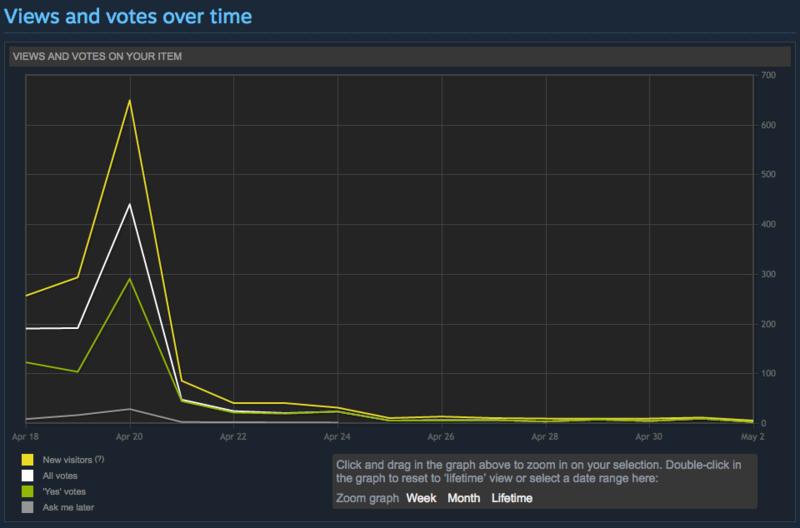 But for the last week of the Greenlight, the game, like many others, was getting handfuls of votes per day — not enough to significantly impact its trajectory to the Top 100. Overall, I think fan enthusiasm (based on vote percentage) and media attention (Kotaku, AG, and previous articles from RockPaperShotgun and Kill Screen) helped propel A Case of Distrust into the sights of Steam’s gate keepers. Thankfully, they liked what they saw, and chose to let it pass. One more thanks to everybody who supports this game. I can’t wait to share more with you. The beat goes on! [insert thumbs up] Good job!